This shop has been compensated by Collective Bias, Inc. and its advertiser. All opinions are mine alone. #TinkandNeverBeast #CollectiveBias Yesterday was my birthday!!! So, I did what any 33 year old would do! I threw myself a Tinker Bell party!! Obviously! A few days ago I stopped in to Walmart to pick up our copy of the long awaited Tinker Bell and the Legend of the NeverBeast!! To say we were excited would be an understatement. In fact, in my excitement, I had lost all sense of the date and went to Walmart on March 2nd (the day BEFORE the DVD was released) Avery and I went back again on the 3rd and my little pixie tracked down a copy for us! She even conned me into buying her a couple more fairies to add to her growing collection. We hurried home, and immediately popped the movie in the DVD player (Someday we’ll be high tech enough for BLU-RAY) and settled in for the cutest, sweetest, and funniest Tinker Bell movie yet! Even Dave loved it!! I planned my party! 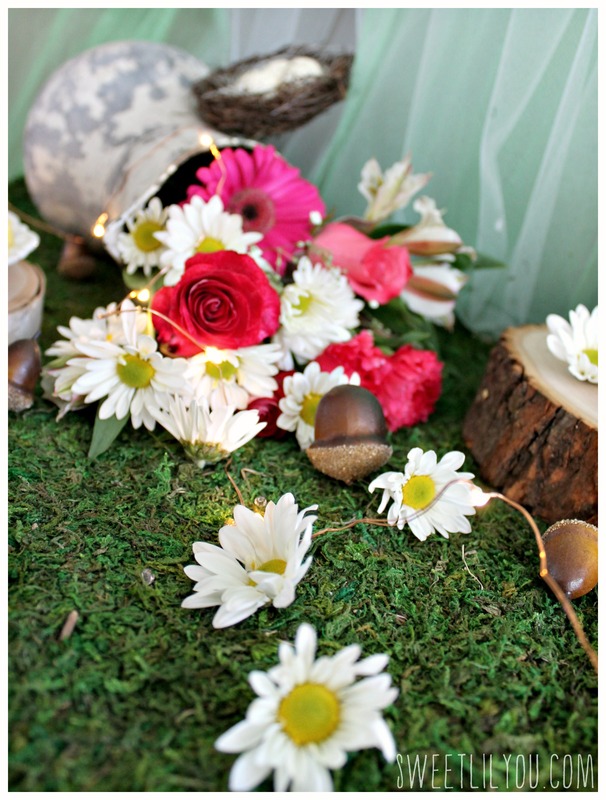 I wanted the party to really be about the details, and to feel like it was being held in Pixie Hollow! Avery picked out some beautiful pink flowers and I arranged them like they were spilling out of an old pitcher. I put out a “blanket” of moss, and spread acorns and pine cones around. I also put small crystal beads all around to give the look of dew drops. Since Tink is a Tinker Fairy, I wanted to put out small objects that I would expect to see around her home like thimbles, buttons, a magnifying glass and this fancy broken dinglehopper fork. As a finishing touch, I picked up some “fairy lights” to give a hint of pixie dust! Of course, the fairies came out to join the fun! Periwinkle, Silvermist, Rosetta, and Tink!! For the cake I made a small, 5 layer ombre cake in Tinker Bell green with pink frosting and sparkles! 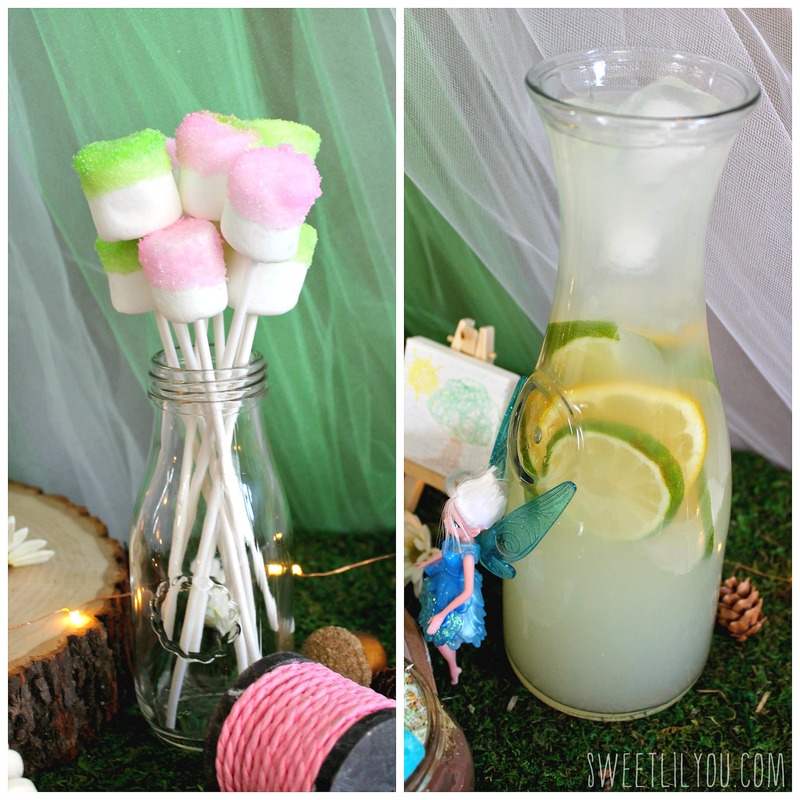 I made Pixie Pops (Avery called them Fairy wands) with sprinkle coated marshmallows (dip marshmallow in water, shake off the excess, and roll in colored sugar) And Morning Dew (lemonade with lemon sparkling water and sliced lemons and limes) to quench our thirst. The Fairy Fruity Flowers were a big hit! 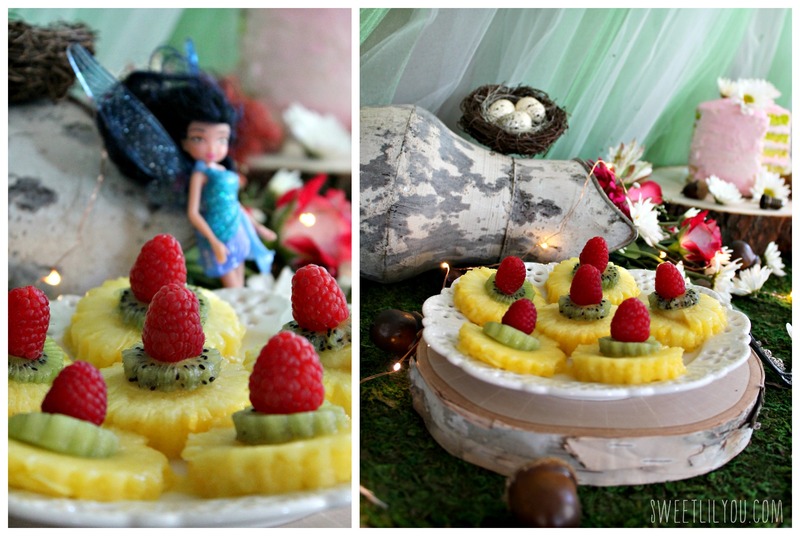 Using different sized flower cookie cutters, I cut out the pineapple and kiwi, then topped with a raspberry. I also made traditional Fairy Bread! Fairy Bread is simple, and sweet. White bread, spread with butter, and sprinkled with nonpareills. 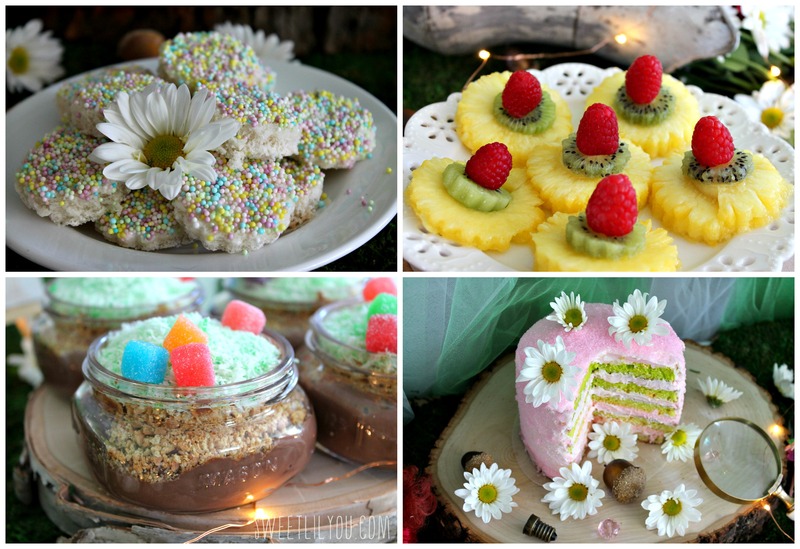 It is a popular party treat in Australia, and I thought it would be a perfect addition to our party fare! Step 1. Crush graham crackers and put aside. Step 4. add a couple drops of green food coloring to coconut and mix until you have the color you want. Step 5. Sprinkle coconut on top of graham crackers. Step 6. Add candy, and serve! 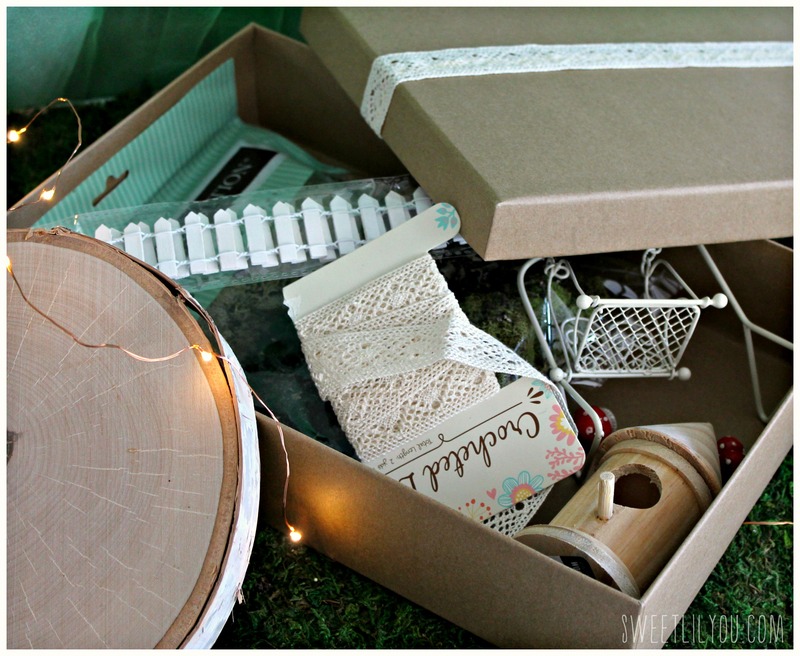 Now, what kind of party would this be without a fun activity and something for guests to take home? I picked up some items at the craft store that I thought would be fun for a fairy garden! You can prep the kits for each guest, OR you could put all the items out on a table and let them pick and choose their own! Avery and I worked together to make a cute little garden for Tink! What do you think? I think she likes it! So what do you think? 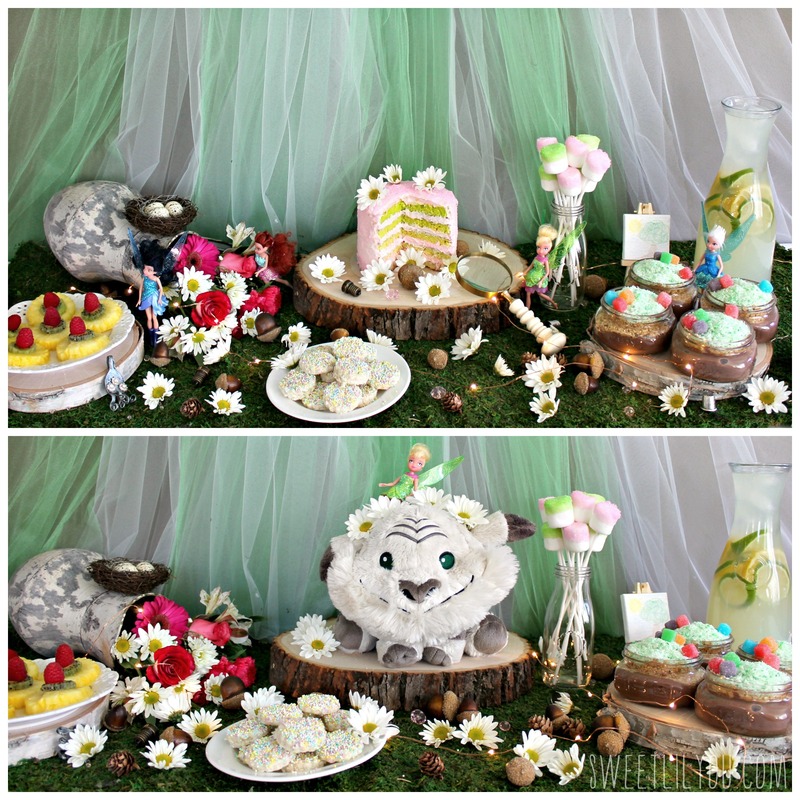 Is this a party fit for a pixie? 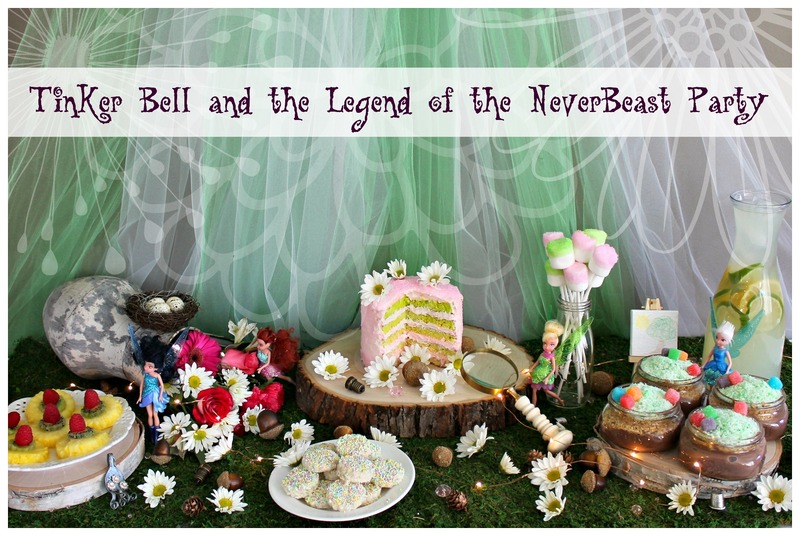 Have you seen Tinker Bell and the Legend of the NeverBeast? If you haven’t, our entire family recommends you do! 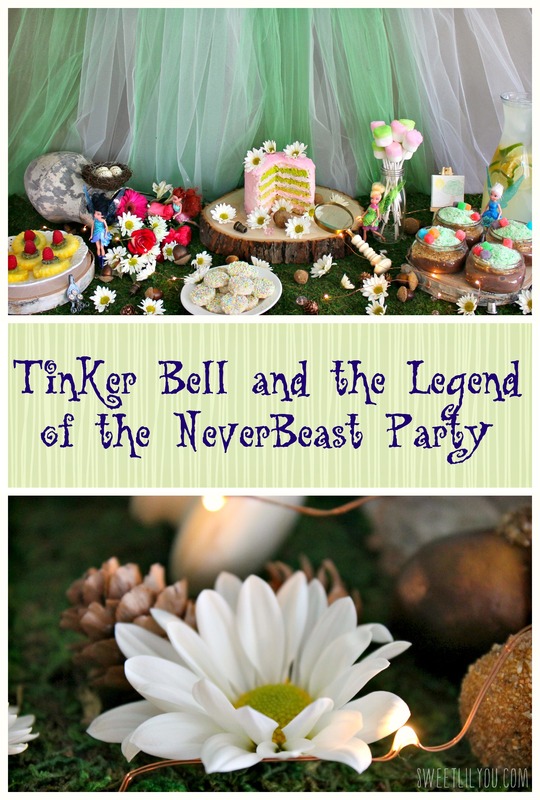 This entry was posted in Disney, parties, Uncategorized and tagged disney, fairies, party, tinker bell. Oh love all of it! And that cake! Happy Birthday! Thank you, Wendy!! It was a lot of fun! Oh what a cute party! I love all the details – especially the pudding 😉 Happy Birthday!!!! OMG, it’s a cute explosion! I wish I could have seen her in full on party mode. Oh I love all of it! 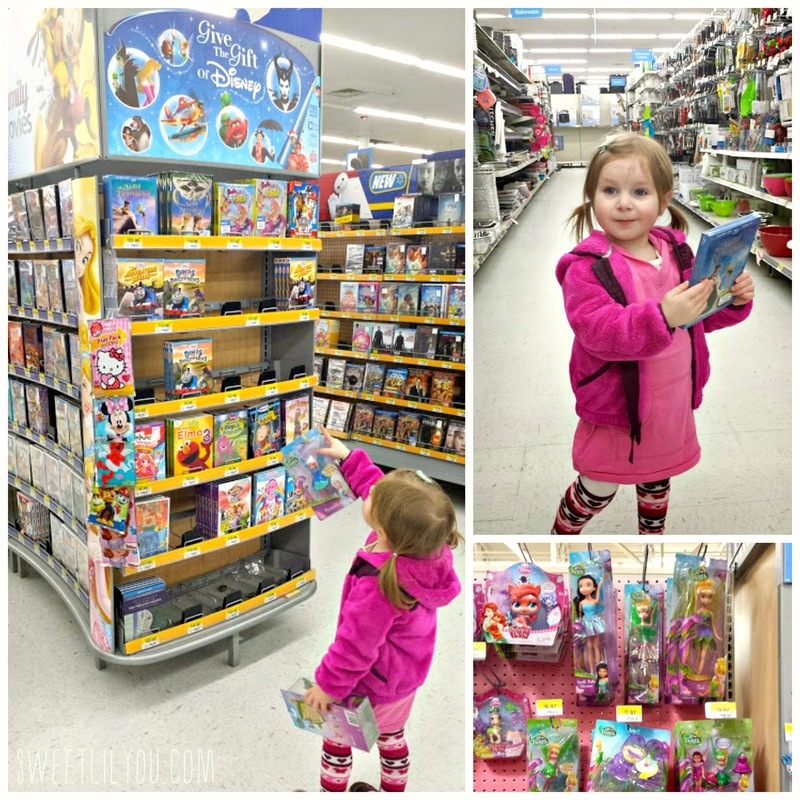 My daughter would love every inch of this, so pretty! You did a great job! Oh, that Gruff! Love him! The whole party has such a fairy feel to it. 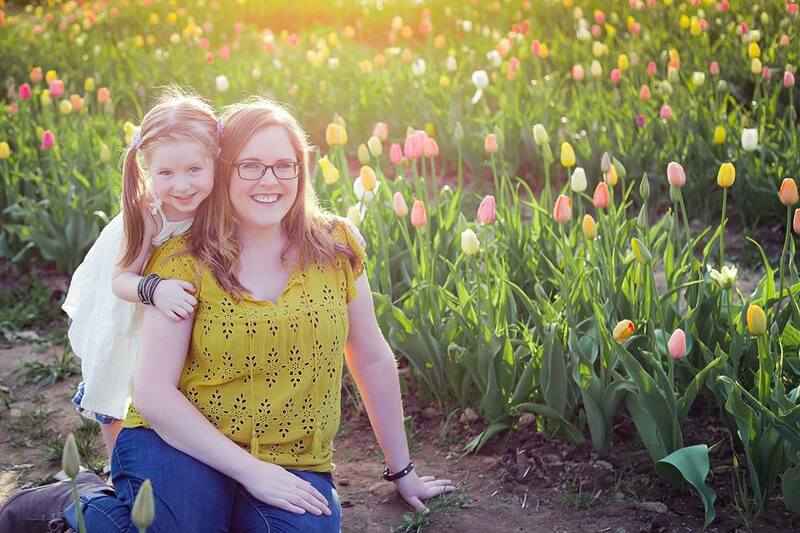 My daughter (and son, too!) would be in complete heaven. Oh, who am I kidding – I would, too! And dinglehopper had me LOLing! Awe, what a super cute party! I love the little touches of flowers the most! That sounds like a seriously fun party!! I love the Pixie Pops! What a cure idea. That is so flipping cute! I just want to shrink myself and live there. Best fairy set up ever! How fun is this! Those fairy grades are the cutest! Wow, you really went all out! What a fun party! Love your cute pudding treat! I absolutely love this display. 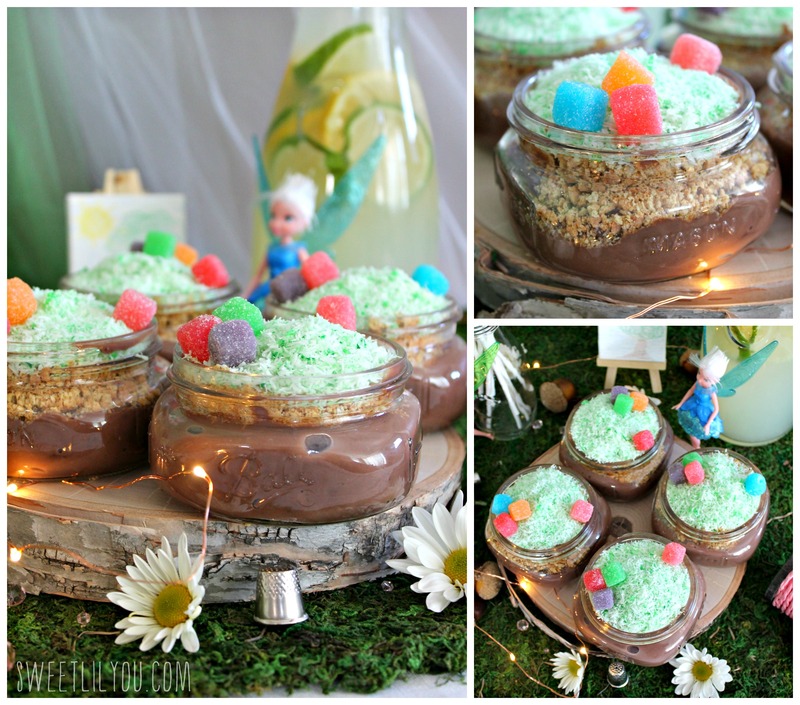 That Pixie Hollow Pudding looks so delicious too! All of those treats look yummy! 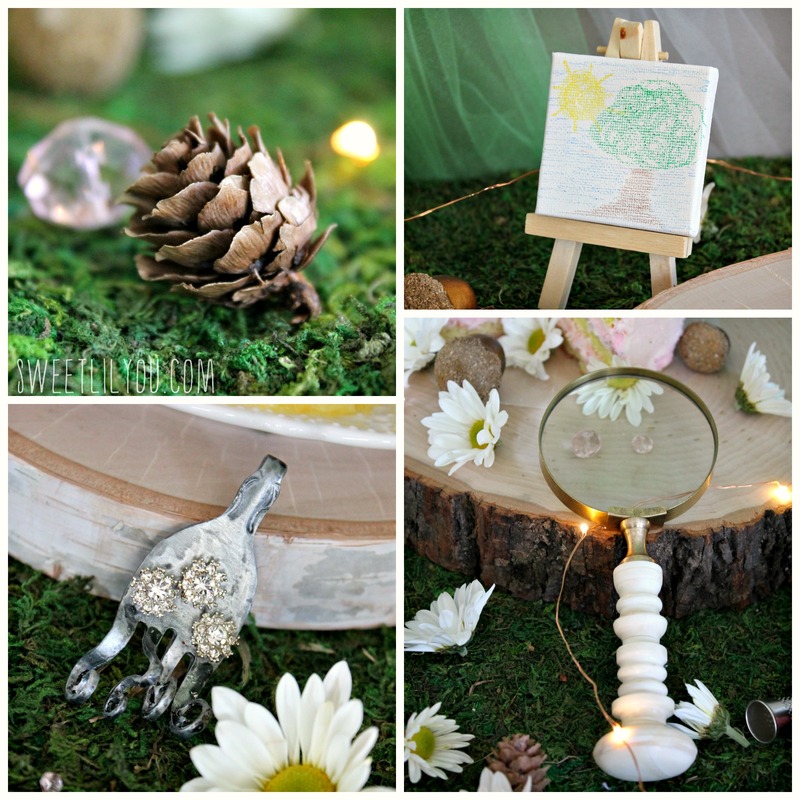 The fairy garden craft is a great party activity! My daughter loves Tinkerbelle. I have thought about making her a fairy garden even . All of your treats look delicious!! 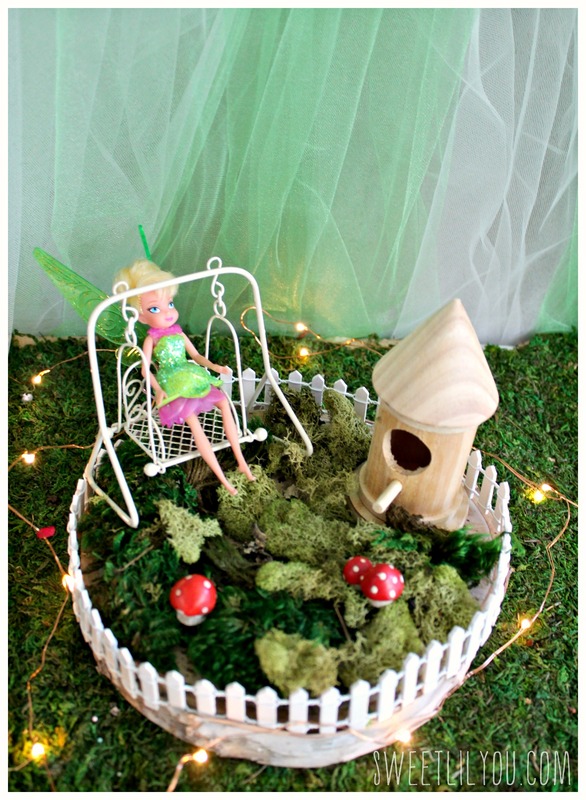 The fairy garden looks amazing! It all came out so cute. 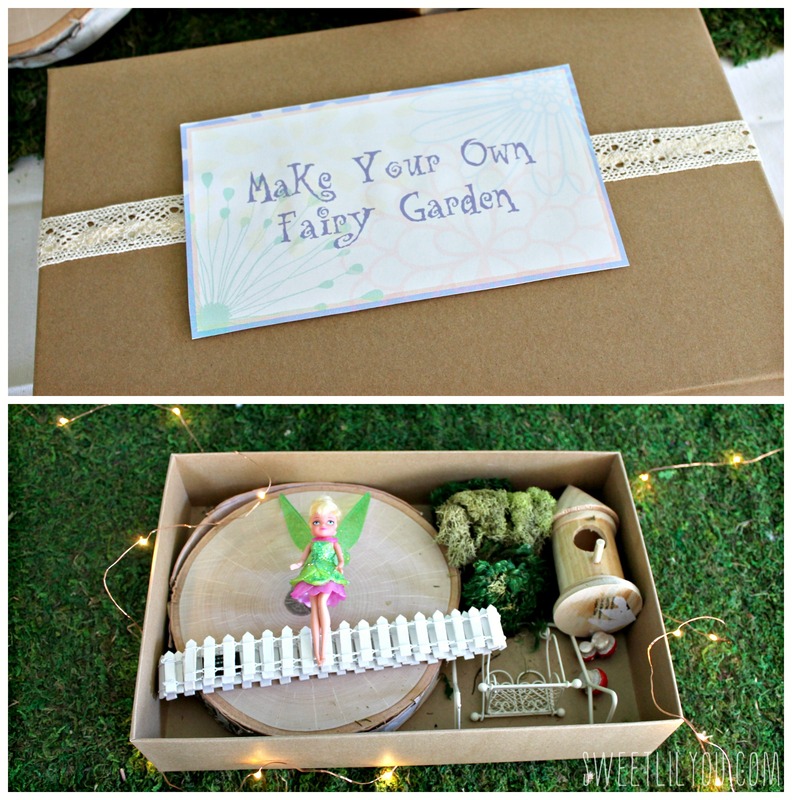 I love the Make Your Own Fairy Garden. Hope your birthday was fantastic! Don’t know that our daughter would be into this, but I have a friend from high school that would love it, does that count? Great idea for the party though. 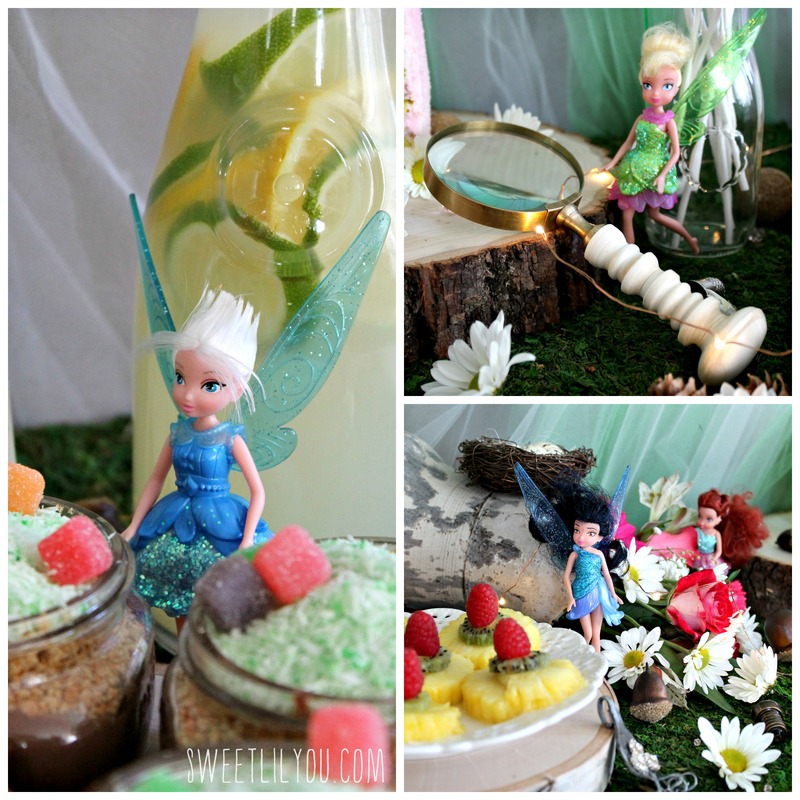 This is such a cute idea for a TinkerBell party. I love all the decorations. My friends daughter would love this for her birthday. I’m speechless… and I live 5 minutes away. I want to be at your next party for you and Tink! 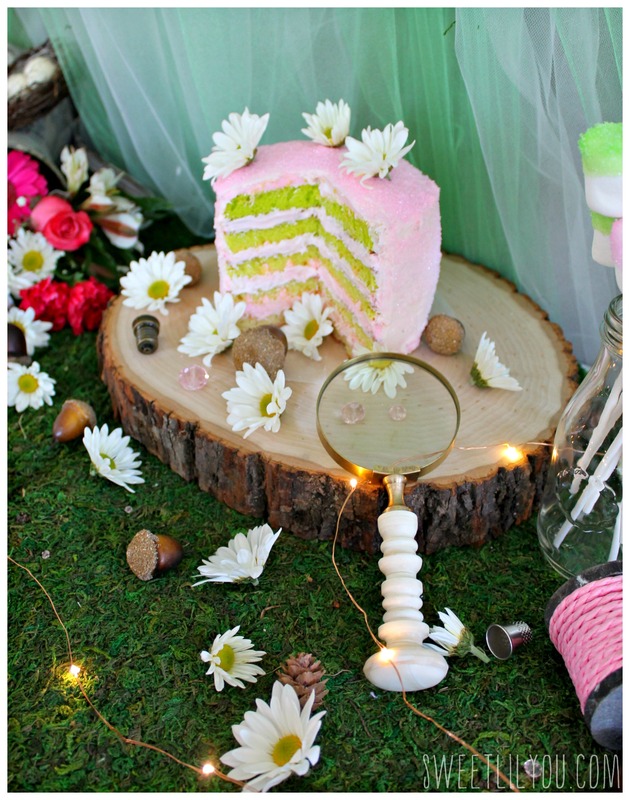 What an awesome celebration- looks perfect for a fairy bday party!!! We are going to pick up a copy this weekend for Addie! HOw creative……I like the pudding idea. I want to come to your arty. We love TInk in my house. My daughter would be so happy at this party.